“Woke” NAB? – North American Baptists, Inc.
I’m not one to stay up on current slang. With two grown children no longer living at home, I generally don’t have the means of learning any new lingo, so when I heard someone use the word “woke” in a context outside of sleeping, I had to get a new understanding of its meaning. Rather than referring to someone who was asleep but is now awake, the meaning of “woke” in popular urban slang refers to becoming aware of what is happening in one’s community, especially in relation to social injustice, racism, and poverty. Both meanings are about moving from an unalert mode of consciousness to a more engaged awareness, but this new meaning of “woke” suggests that someone has removed cultural blinders to reality and is now aware and engaged in a call to justice in real life situations. Those who “stay woke” have moved from ignorance to engagement in penetrating injustice with righteous attitudes and actions. 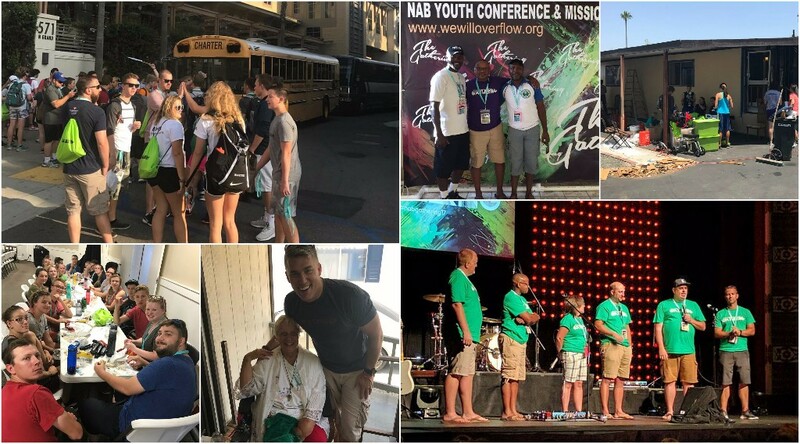 During July 17–21, 2017, nearly 550 students and leaders from NAB churches became “woke” to the realities of urban environments in Orange County, California. At an event called The Gathering, students entered each day into situations where various forms of social injustice, racism, poverty, and a host of other hurts were real and visible. Serving sacrificially, they rolled up their sleeves and engaged with people and projects in the cities of Orange and Anaheim in southern California. Through their efforts, children from a variety of backgrounds received hands-on encouragement and care; buildings, parks, and homes were cleaned or painted; care packages were delivered to local police and fire stations; children from refugee families were shown compassion. This was all done in the name of Christ and alongside NAB churches in the area. As the NAB executive director, along with three other members of the Executive Team, I was privileged to spend the week at The Gathering, working side by side with leaders and students. I am proud of the way students gave of themselves to care for others. I am thrilled that students were able to pray for others and present Christ’s love in difficult environments. I am most excited that many of our students became “woke” to the need for God’s righteousness and justice in real life situations. A single theme lingers in my mind after returning to the International Office. What if the NAB as a conference of churches became “woke?” What if every NAB church became more engaged in issues of social injustice, racism, and poverty in the neighborhoods and communities surrounding their churches? What if God gave us eyes to see how He is breaking through into neighborhoods where darkness has penetrated so deeply? What if we truly understood that God is sending us as a missionary people to engage with those who live daily with the effects of social injustice, racism, and poverty? If you’d like some coaching on how to partner for greater engagement with ethnic ministries in your area, drop us an email at bfuchs@nabconf.org.